News arrives from Ken Denison at Denison & Daves of a large $6.4 million price cut on his central listing for sale, the impressive 79m motor yacht Pegasus V.
Pegasus V was built by the Royal Denship yard in 2003 with a steel hull and composite superstructure to design by Espen Oeino and was originally named Princess Mariana. Refitted in 2006 and 2007, she is Lloyd's classed and MCA compliant. 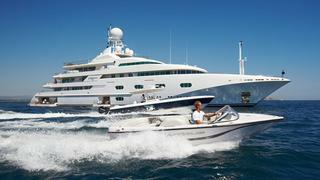 Her six decks come equipped with a multitude of extras including a helipad. A party deck has a disco/piano bar with a marble floor and smoke generator and the cinema has large reclining chairs and 100 inch HD television with Dolby surround sound. There is also a spa/massage room and a dedicated children's play room. The piece de resistance, however, may be her massive beach club with bar, television and tender bay, which converts to a swimming pool. An interior by Francois Zuretti accommodates 12 guests in six staterooms – a full-beam owners’ suite with office space and a private terrace plus two VIP suites, two double staterooms and a twin cabin. All are finished to the highest standards and all have entertainment centres, full en suite facilities and panoramic windows. Included in the price is a 35-foot custom air conditioned Royal Denship limousine tender. Twin Deutz 3,190hp engines give her a cruising speed of 14 knots and enormous range of 7,000 nautical miles at 12 knots. Pegasus V is now down from $94.9 million to $88.5 million.